Standard - $4.99 Only 1 left! Yeah, he's a mean one. We've all heard the song. They spend a lot of time talking about how bad of a dude he is, but, deep down, we think he's actually a decent guy. After all, his heart did grow 3 sizes by the end of the tale, and when all was said and done, he did give everyone the gifts that they deserved. Maybe he can even help you with your own gift-giving ways... all you need to do is bring this Dr. Suess Grinch Naughty or Nice Tote Bag! 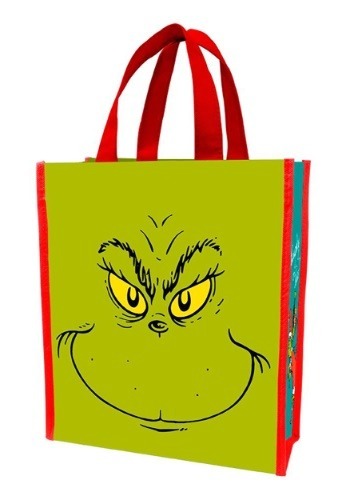 This Grinch Shopper Tote Bag is officially licensed and features the iconic Dr. Suess character on the sides. It's made from recycled materials and features a pair of sturdy handles on top. You can use it while you do your Christmas shopping, or you can fill it up with presents and bring them to your next holiday gathering. You can see just how nice the Grinch can be when you this treat bag! It's made of recycled materials and it'll help you carry some treats to your next party, so it might even help your own heart grow 3 sizes bigger!